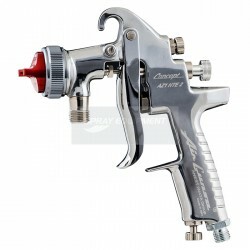 The AZ1 High Transfer range of pressure spray guns feature a newly designed range of air caps. This new technology allows even less experienced sprayers to obtain high quality and consistent finishing. The AZ1 High Transfer range of pressure spray guns feature a newly designed range of air caps. This new technology allows even less experienced sprayers to obtain high quality and consistent finishing. These air caps develop either a traditional spray pattern or a long and tulip shaped spray pattern, both with an extra fine particle distribution and very little over spray. The reduction in paint over spray through improved transfer efficiency also reduces spray booth filtration costs.